It's a nerve-wracking experience to choose your exterior paint color. After all, this is a color you have to live with for a good long time. It helps to choose tried-and-true exterior paint color schemes, rather than coming up with one on the fly. Following is a photo gallery of ideas you can use to paint your home's exterior. 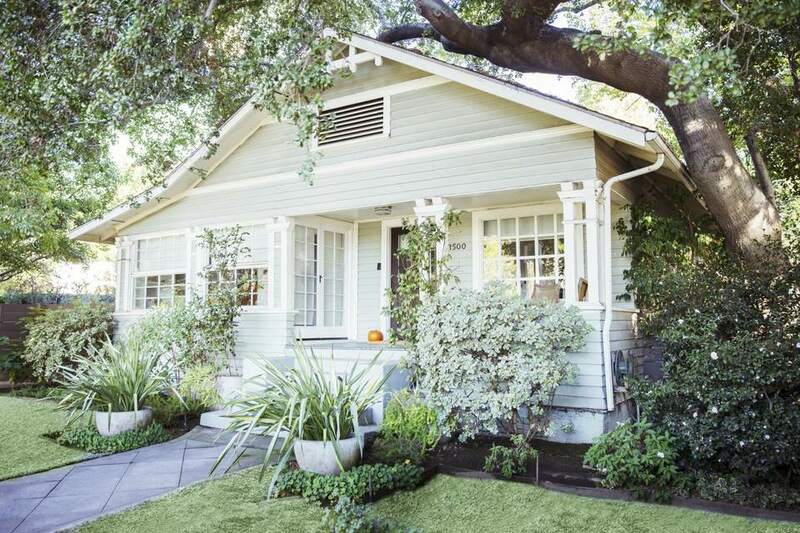 No, you don't need to have a Craftsman-style house to use this exterior paint scheme. It's a soothing, homey paint design idea that evokes visions of long-ago days of children roller-skating outside and Dads Simonizing their Mercury Coupes. Who says it has to remain in the past, though? With Tudor, the overly wide trim means that it cannot be ignored. In this example, the Tudor strokes complement the field paint, both of which work in concert with the house's masonry. Always paint Tudor half-timbers a darker color than the field for an authentic look. When is painting season? The Upper 30s/low 40s Fahrenheit is generally regarded as the lowest you would want to paint. Moisture, though, is as big a factor. Wait at least a full day after rain to paint, and never paint when the surface is even the least bit damp. Here is another Craftsman-inspired exterior paint color idea that will work with almost any house. These muted, earthy colors seem almost a part of the California landscaping. This farmhouse-type color scheme delivers a maximum punch with its contrasting black shutters and white trim. Red, white, and black is a traditional look, giving your home a New England appearance. This is a prime example of taking a fairly ho-hum blah house and turning on its side with exterior paint colors. However, this isn't about choosing bizarre colors; it's more about choosing a larger-than-normal number of colors (four) and making full use of accent walls. Those two accent walls (Coastal Fog) serve to highlight the house's many peaks and liven up field paint so that it does not get boring. Bold and electrically blue for your Cape Cod, Colonial, or other classic homes. White molding, casing, and trim are always a wonderful way to accent a blue house. Yellow can be a touchy subject when it comes to exterior house paint colors. First of all, it reportedly fades more easily than other colors (though recent advances in paint technology allow for longer-lasting yellows). Secondly, will the neighborhood take up pitchforks and revolt at your egg yolk-yellow house? Not so when you tone down the yellow. This exterior color sidesteps garish yellow tones, bringing it into the warmer, friendlier range. It looks like the natural wood siding of a cabin in the forest. Really it's exterior paint. While natural, stained wood is gorgeous, painted wood is far more practical. How simpler does it get? Found on countless traditional homes, and for good reason. This white exterior paint scheme, with green shutters and door, is elegant and easy to maintain. Whenever you have a dark background of foliage like the one shown here, it is always wise to use a light color for your house to make it pop out. What Is Better For Exteriors: Satin or Flat Paint?